After being a private residence the manor was rented by the red cross who used it as a hospital. In 1948 they passed it to the local health authority who continued to operate the hospital. There was a disputed between the owner and the health authority over rent and a promise to buy the building which was simply to expensive at the time, so the hospital had no choice but to close. After the fire in 1952 it was turned into flats, the flats remained as residences until the building was bought in 1985. 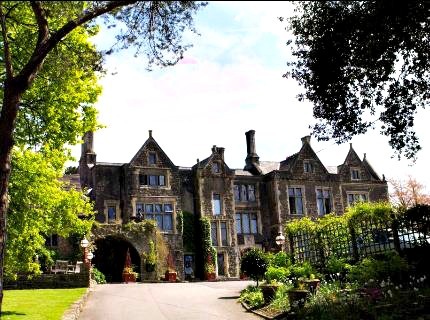 After this heavy renovations began and the building has now been converted into one of the most illustrious country hotel Wales. The building has seen 2 major fires in its life, one in 1923 which was devastating and only left the shell of the building, and another in 1952 which wasn't quite so destructive. Most of the manors paranormal activity seems to take place within the "oak room". This room has been a hot spot for various ghostly encounters with some people claiming to see an entire family of ghostly figures sitting round a table. One of the most commonly seen spirits within this room is that of a young girl who has been seen sitting in the corner, or the sounds of her laughing coming from the room when it is empty. She has also been seen in the garden of the property but who she is or why she remains is unknown. Another frequently seen spirit within this room is the apparition of a man wearing early 20th century civilian clothing, but again his identity is forever lost. The manor seems to have a rather unusual spirit residing here. Between the hours of midnight and 1am a female ghost has been seen gliding from the drawing room to the bar area where she vanishes. In one of the old layouts of the building there was a stair case where the bar is now, so it seems she is stuck in some kind of habitual loop. Some staff of the manor have even claimed to have gotten used to her as she is never seen any other time or in any other area of the manor. There is also a story about a large heavy painting flying off the wall when someone in the bar area questioned the existence of this ghost.